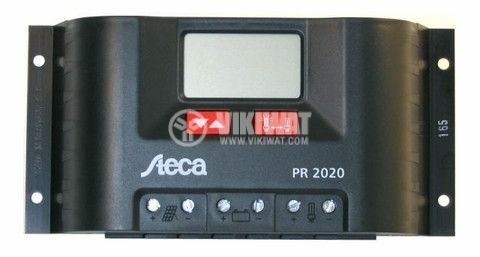 Controller for solar panel 2020 PR 20A 12V 24V display. Controller for solar panel 2020 PR, 20A, 12V / 24V, with display. List Price 245.00лв. VAT Incl. 232.75лв. VAT Incl. Steca PR 10-30 series is a leader in solar controllers. Latest charging technologies combined with a Steca AtonIC-II algorithm calculates the state of charge of the battery, provides full battery maintenance and control of the connected photovoltaic generator (maximum power up to 900 W). Through display the user is informed for the operating mode. The rate of charge is displayed graphically by an analog indicator. The controller has an energy meter which can be reset by the user. System parameters can be displayed with numbers on the screen. short circuit protection on both input and output.